To achieve success we had to create an application with high scalability, versatility, and purpose in modern society. We ticked off economic, social, and environmental benefits by looking at the issues people and the Earth face, and solving as many issues as possible. We understood that many people forgo environmental stewardship for the pursuit of monetary gain, but this is a very dangerous way of operating, as the Earth's resources could deplete much quicker. Companies such as Tesla Motors show that environmental stewardship and profit can go hand in hand, and we decided to make our business model advantageous to the environment, and for monetary gain. Furthermore, today's workers are currently a part of the 'gig' economy. On top of their primary jobs, many people want or need supplementary income, or simply to monetize their free time, as they can do with Uber. 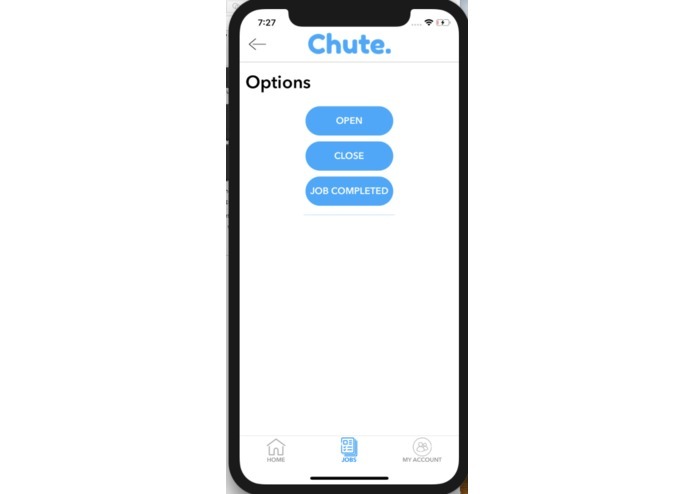 Chute works in a similar way, in the sense that users can work on their own time, and can be available for jobs at their own convenience. Many parks and public areas in Toronto and in the world often find themselves flooded with masses of waste in need of collection. The weekly collection performed by the government is often not enough to handle the strain being placed upon by the people, and not to mention that it is one of the most inefficient services provided by the government. Chute makes a long, expensive, and complicated process of waste collection simple through the powers of automation. 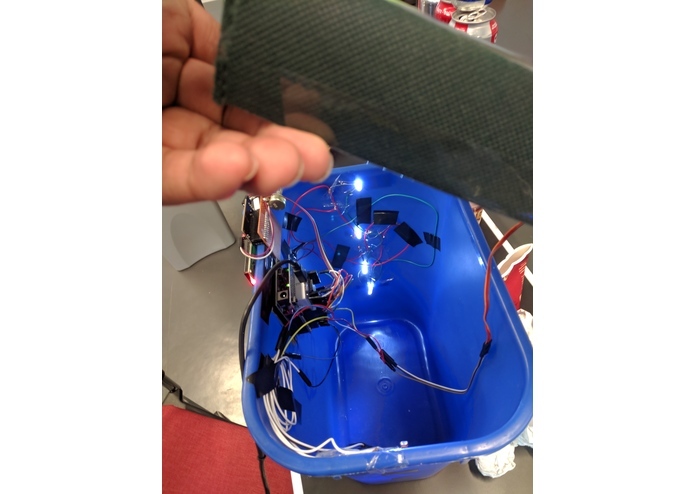 We have fit this recycling bin, which would be found in a public setting such as a park with sensors and motors. Once it is filled, the lid will close, and a notification will be sent to available certified workers, who may choose to accept the cleanup job, or allow another available worker to take the job. Once the job is accepted, the worker will be able to open the bin, empty the contents, and will be paid upon completion of the job. 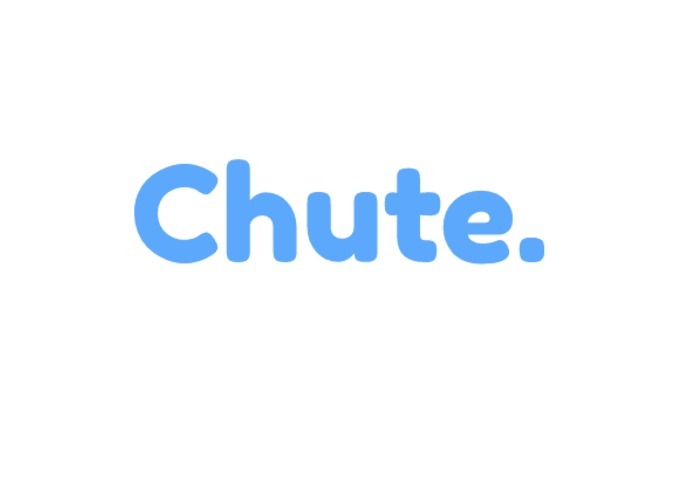 "Chute." was built using both hardware and software in conjunction. 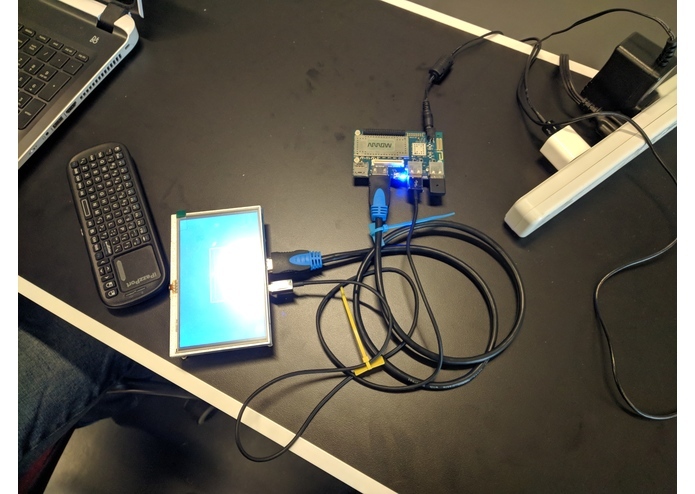 The hardware included an Arduino, LEDs, light sensors, a display, a motor, and a Qualcomm DragonBoard 410C, which acted as our central server, where all messages are routed through. All of this hardware was setup on a recycling bin to monitor how full it is. 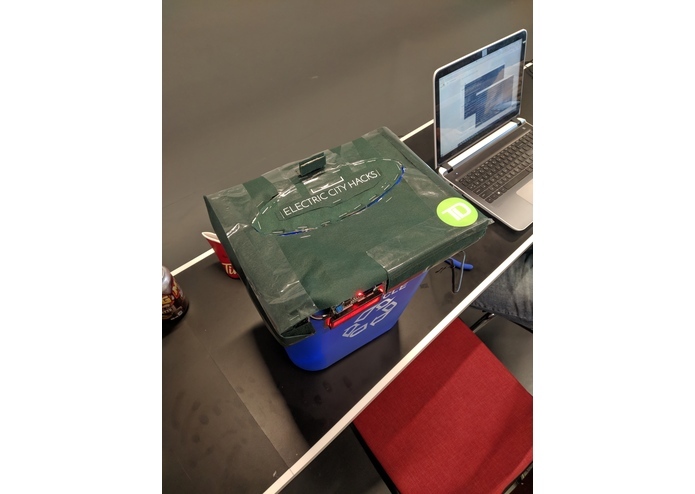 In layman's terms, the small LEDs are powered within the recycling bin at all times at 25% intervals, and when the light is blocked by garbage, the bin will understand that it is filled to that specific interval. Once all lights are blocked by garbage, and the light sensor can no longer pick up any light within the recycling bin, the motor willclose the lid of the recycling bin such that waste does not overflow. 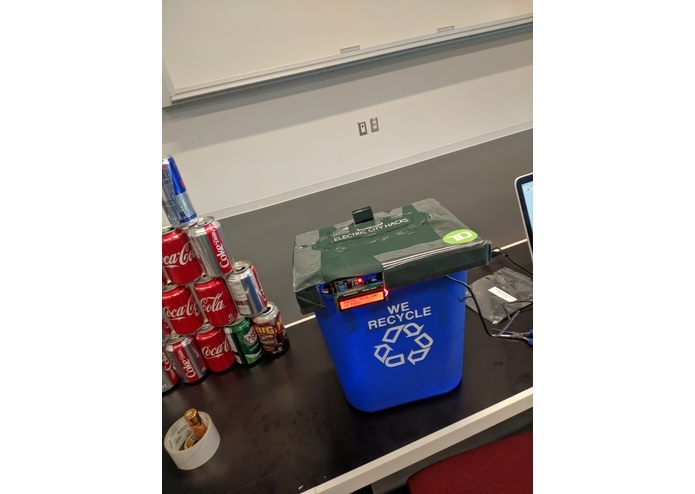 Once the garbage can is full, the data is transmitted through MQTT using our Qualcomm as the central server to the iOS app, which was created in Xcode using Swift. 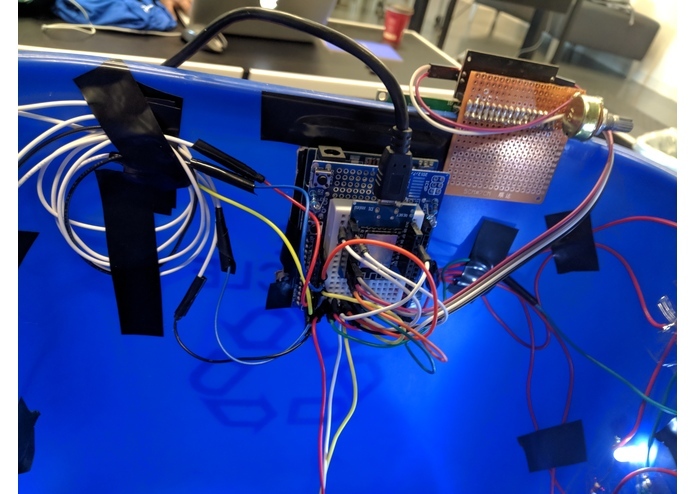 The app involved being connected to the server so that it would know when the garbage can was filled, which also included a connection to the hardware itself. 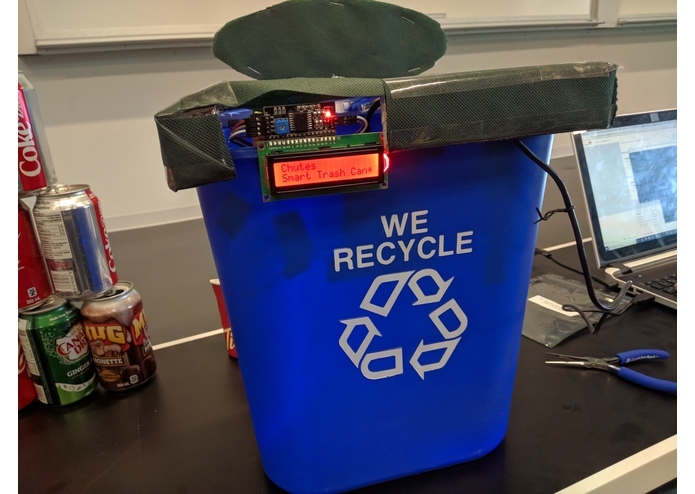 For example, when a garbage collector takes a job, he has the ability to open the lid of the recycling bin through the app, which requires a connection directly to the hardware using MQTT. This hackathon is no different than all others in the sense that there is a looming time constraint over the project. The task of planning, creating, testing, implementing, and presenting a working prototype in under 37 hours is an extremely daunting task, and proved to be very challenging. This required a great deal of project management skills, including allocating work through delegation, making schedules to effectively use the time given, and losing a significant amount of sleep. This time constraint was certainly the most challenging part about the hackathon, but we were able to overcome it through strong organizational and management skills. Another issue was the lack of hardware or issues with existing hardware. For example, before using light sensors for our project, we initially planned to use ultrasonic sensors. However, we failed to bring our own sensor, and the MLH Team did not have one either. This involved innovating through improvisation, which led us to deviate from our initial plans and find new solutions. 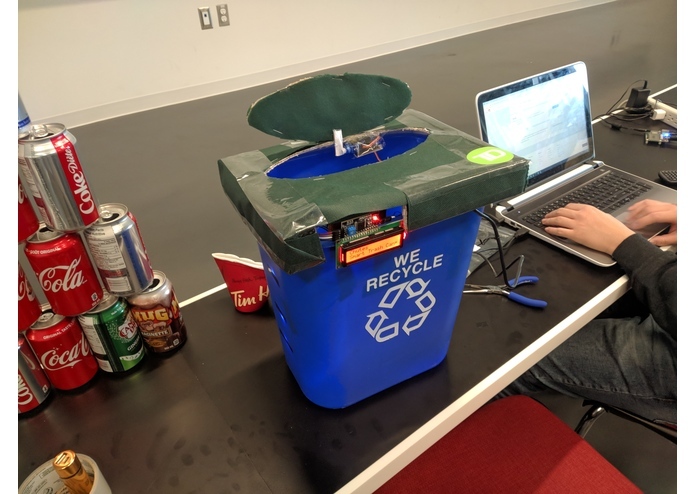 The forced creativity due to limited resources and time led us to come to interesting decisions, such as using a cardboard box as our recycling bin lid, and of course, using a light sensor to determine how full the recycling bin is. As a group, we are very proud of the fact that we went through the entire process of developing a hard/software hack with the amount of functionality and polish within our allocated time. We all worked very hard to meet our goals, and we are very proud of the project we were able to create from scratch in such a limited amount of time. We were also proud of our creative use of resources and ingenuity. We were able to find multiple legitimate problems with society and solve many of them with the use of a single service. We are content with the fact that it can serve so many people in a multitude of ways. Lastly, we are genuinely proud of the fact that our product can do a great deal of social and environmental good, while simultaneously holding the potential of massive profits for workers and the developers. Our app makes the world a better place through environmental stewardship, allows people to work and earn money based on their own schedule, and provides replacements to crumbling, inefficient, and wasteful government infrastructures currently in place. We were pleasantly surprised with the amount of new information we gained throughout the course of this weekend. The nature of the time constraint caused us to be resourceful, and the plans we had for our product required us to learn many new techniques, languages, and more. For example, to relay data between the hardware and software side, we required the use of MQTT, which 3 of our group members learned at a working level in merely 3 hours. 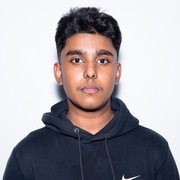 We were truly baffled with the amount of progress we were able to make, and we understood that it was largely due to the time constraint, and the fact that people learn faster through practical uses, rather than in a classroom setting. We also learned valuable lessons about project management, leadership, and teamwork, which helped us accomplish our end goal. The growth potential for this app is limitless. 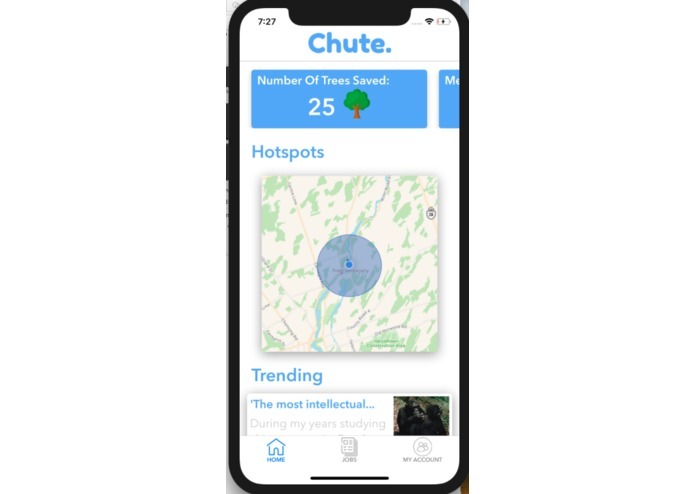 As a pilot project, Chute bins would be implemented in select large cities such as Toronto, Montreal, and Vancouver. Chute is extremely versatile and scalable, as the sensors on the bins could be installed for approximate $100 per bin. Cleaning recycling bins are not the only jobs available for implementation. 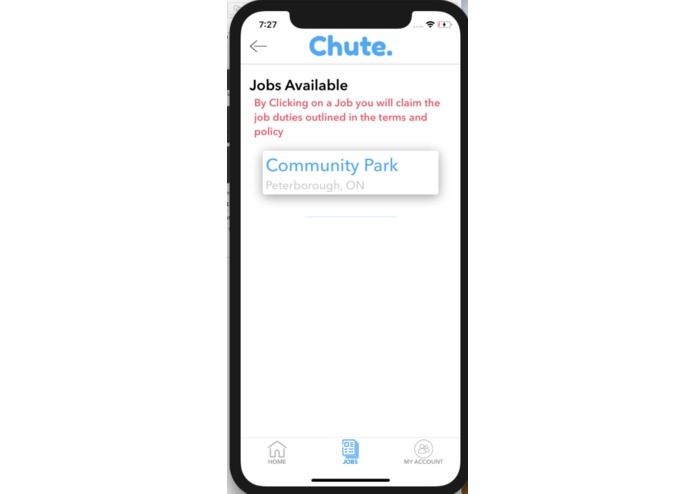 If the initial Chute model is a success, it can be expanded to other jobs, such as automatically hiring seasonal workers, filling the tens of thousands of unfilled jobs in cities through hiring automation, using machine learning to detect damage in the city and save inspection money, and much more. Furthermore, we could implement solar panels on all of the recycling bins for an even greener solution. The growth potential for Chute is virtually limitless, and has the potential to benefit the world economically, socially, and environmentally through the powers of automation. I helped create the iOS Application. I helped with bug reporting, testing, hardware installation, and mechanical work. Furthermore, I organized the pitch and external documentation. I created the hardware side of this project, from the arduino sensors integration, to the ESP8266 MQTT Broker, to the Qualcomm service. I also helped with the mechanical and physical construction of the device.